2. 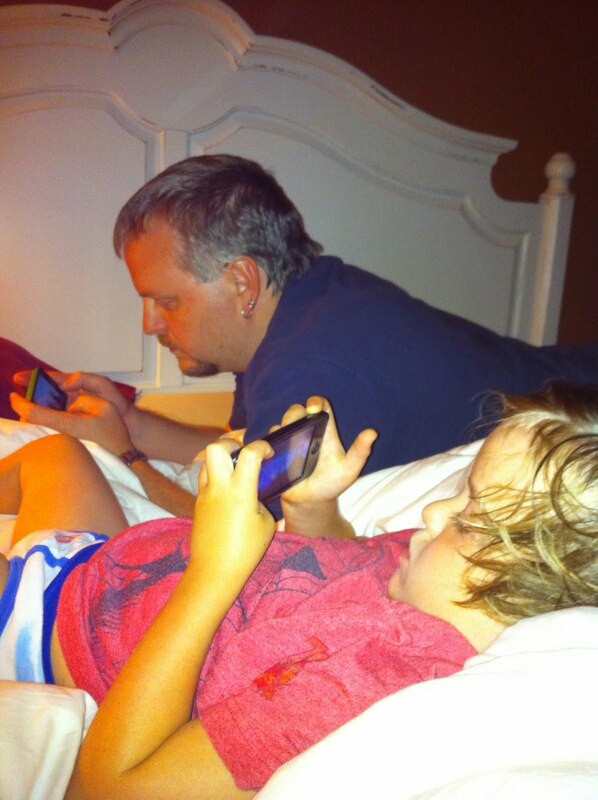 Everyone (except Zac) is now addicted to the iPhone app "Angry Birds." 4. Zac is SO obnoxious lately... but all we can do is laugh. He typically only wants what Deacon has... and it isn't good enough to have the same thing- he has to have the exact thing Deacon is having (as in the same bowl of cereal, the same plate of food, etc...). Tonight Zac was chasing Deacon around the living room sobbing trying to get at Deacon's snack. Poor Deacon is so tormented by Zac... thankfully he takes it in stride. 5. I started packing for OHIO today!!! I have a horrible tendency to overpack... mainly because when Damien and I first got married I packed for both of us before one trip- and we got to our location only to realize I had packed Damien 13 shirts, one pair of pants, no underwear and like 20 pairs of socks. It was ridiculous. I've never lived it down. So I've gone to the other extreme. I try to counteract it by packing early- and spending the day before taking things out... but that's also a double-edged sword and cause for me to forget something as well. I'll never win this battle. 6. Deacon added another request to his Ohio "wish list"--> visit a "pancake store." Ahh yes. We have grandparents who are amazing cooks and we are choosing to spend the majority of our time eating out- between my requests, Damien's requests and now Deacon's requests we'll be lucky to get in 1 homemade meal per parent. LOL. 7. Growing up in my house we had this rule that you had to say "stop it, stop it, stop it" if you REALLY wanted someone to stop doing something. This rule was especially put into place when going up the stairs... when you're walking up the stairs you can pinch the booty of the person going up in front of you... and you can pinch them only until they say "stop it stop it stop it." It's something we still do to this day... and it's something that has been passed on to Damien & Deacon. Now no one wants to go up the stairs first... and if you know you're going up the stairs with other people it's best to just run as fast as you can... or try not to go first. It's so funny watching this with Deacon- something I did as a kid... it's the little things in life, right? 8. Deacon had his pre-kinder pediatrician appointment... he calls it his "shot appointment." He was SO upset about these shots... but he is SO much like his daddy. He insisted on knowing every little detail about these shots. With me, I just want them to do it and get it over with. Deacon wanted to know how the medicine goes into the shot, how the shot goes into him, why he has to get shots, etc... He even took as far as NEEDING to watch the shot go into his skin (a part I cannot handle watching)... the nurse said to him, "Honey... it's best if you don't watch"- and that freaked him out, he started crying, "But I really really want to watch!!! "- ok ok!!! Weirdo. 9. This week Zac learned all about light switches... and is now obsessed (just add it to the laundry list). He sobs if we don't let him turn on and off the lights and fans. Sobs, throws himself on the ground, hysterical... the boy is a drama queen. Who in the world does he get this from???!!! I'm shocked. Are you still mad because I sided with Damien on the pink stroller issue?!?!?! YOU SIDED WITH DAMIEN ON THE PINK STROLLER???? OMG!!!! AND -- NO PICTURES, AGAIN???!?! I NEED ASPRIN! Austin plays with barbies. A lot. I think it improves his conversation skills. :) Plus, its pretty funny when all of his dinos come crashing down into the barbie house. this was a good one! I love it. the angry birds comment made me laugh and i want to go to OHIO! I want to see the salt pile! Psst-check out gwen stefani's son kingston in last week's (or the week before?) us weekly. i thought of you and deacon because he had his nails painted and he looked so cute. i wonder if he wears boy rings? check it sista! LOL Marty!!! Just for clarification, even though I sided with Damien on the stroller, my son's ALL TIME FAVORITE toy has been his baby stroller... AND his toenails are painted!! So I am an equal opportunist as well!! Oh and when we went to the circus it was Deacon that wanted the primary color toy and my "tough-guy" who wanted the frilly pink princess toy... and I willingly indulged him!! ;-) LOVE YA!!! Amanda, your 10 on Tuesdys always make me laugh out loud! Amanda .. sorry I got to Ohio first and oops no more perch! They were sooo good. The chips, french fries and Cameo pizza also were just waiting on me. AND best of all I got to meet MILO. Love him! He's so sweet. Not too keen on letting me hug him but what a beautiful doggie.